For several years I have made Christmas ornaments as gifts. Several went to co-workers at ornament exchange parties and others were given to family and friends as gifts. 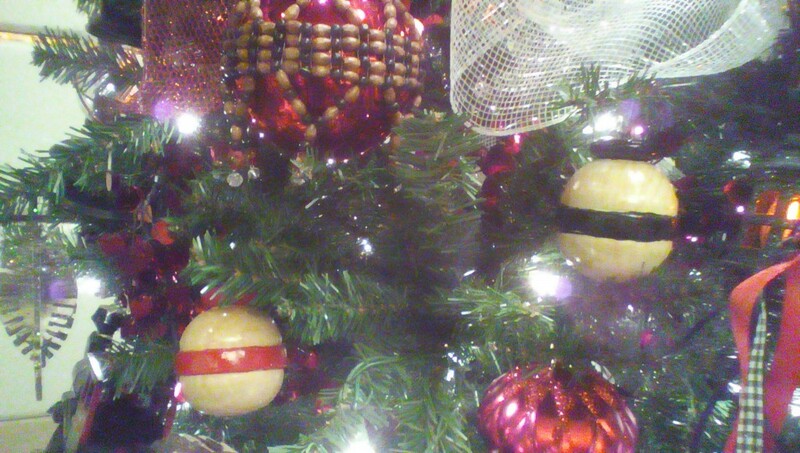 After retirement, I resolved to furnish a tree with mostly handmade wooden ornaments. A friend of mine had decorated trees for a local charity (Kootenai Health Foundation “Festival of Trees”) so I approached her to help with the design for the 2015 event. 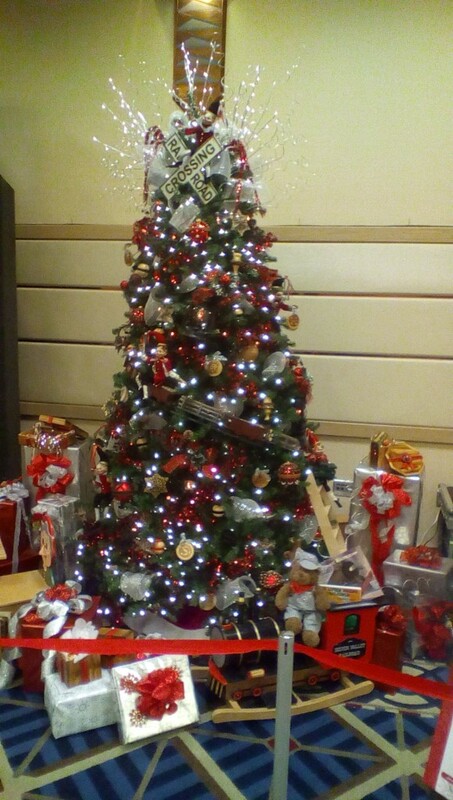 This annual event consists of approximately 30 decorated trees that are displayed at a local resort hotel and then donated for a fund raising auction. 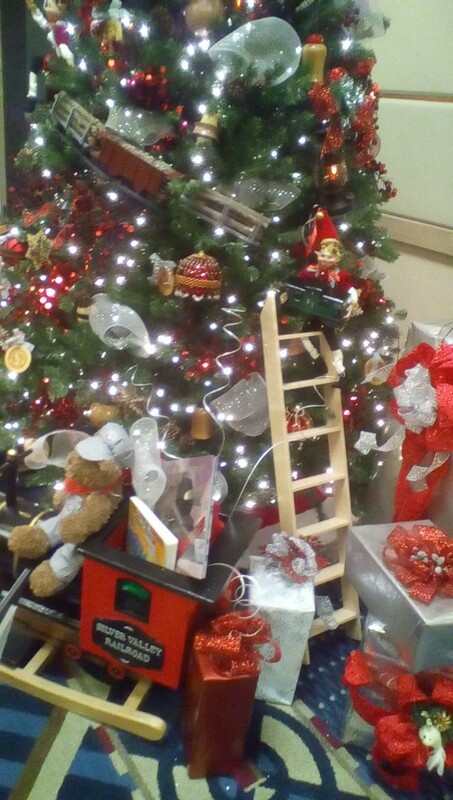 Debbie Lane agreed to design my tree with a railroad theme. My nephew, Jake, agreed to supply some of the materials required and my brother, Bryce (the model train enthusiast), was enlisted as rail car adviser. 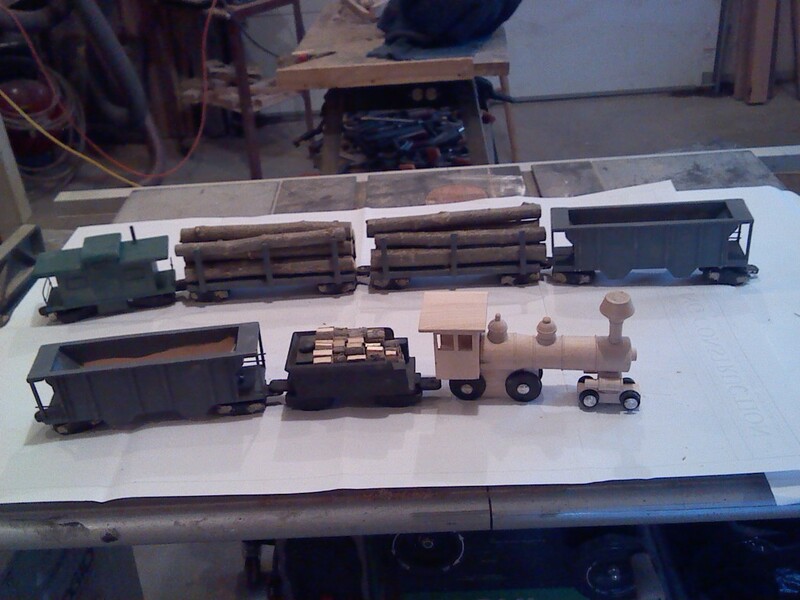 So last February I started on the focal piece of the project, a model train set entirely handmade from wood. I have often used reclaimed and scrap materials for ornaments and other projects so I searched my scraps and tried to utilize materials that were already on hand. Jake provided two planks, one cedar and one pine, from his 1910 era barn. Several people gave me tree trimmings and I purchased the wood stock of another woodworker at his estate sale. 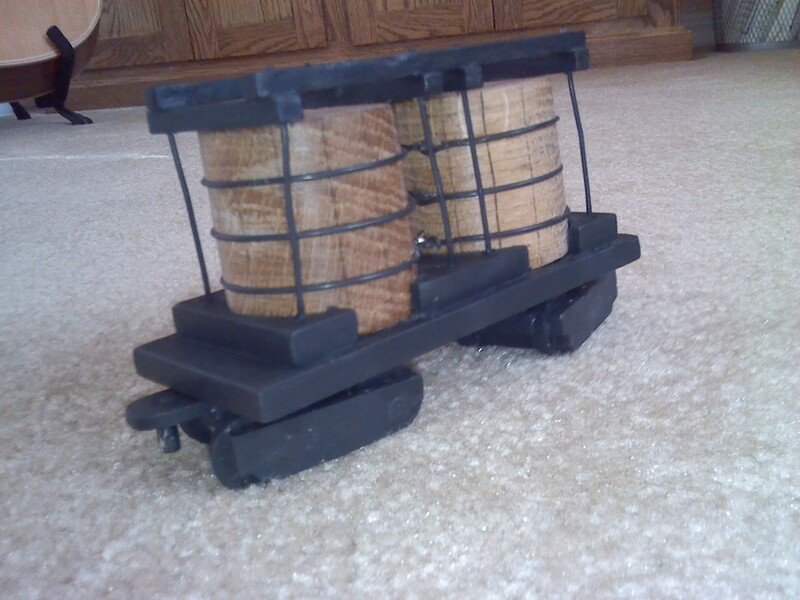 I searched the net for pictures of antique rail cars and used them in the design of the set. My first challenge was to lay out the cars to a common “gauge” and proportion. Each car had eight wheels anchored in swivel trucks and mounted on steel axels. This was the most tedious task of the project as the total 64 wheels had to be turned to equal diameter including the typical flange common to all rail wheels. Each car was then fitted with a steel pin that extended into the car and allowed the truck to pivot. All the cars were then fitted with typical details to mimic the original. Most have access ladders. The caboose has a smoke stack for its wood stove, the log cars have real wood logs strapped to them with chains, the ore cars have real gravel heaped to their tops, and the tender has real split firewood ready for stoking. 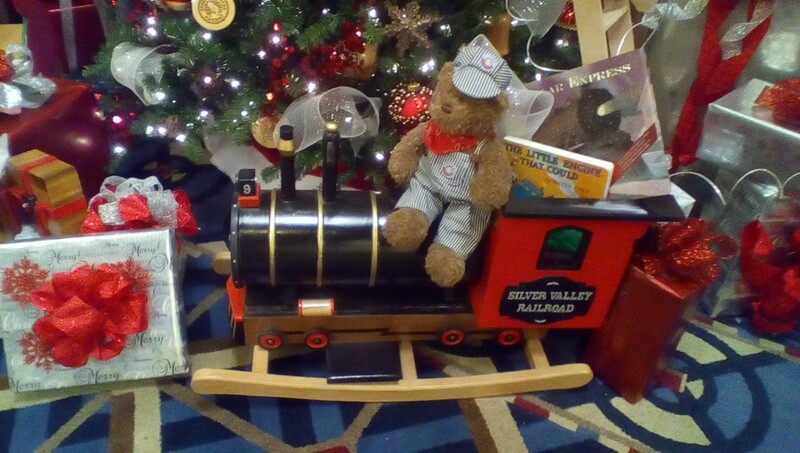 My expectation was the train would be set out on tracks in front of the tree so I made two boxes from the pine planks to store the train out of season. When I laid out the boxes I discovered there was room for an additional car. The tank car was made as an afterthought to fill this space. 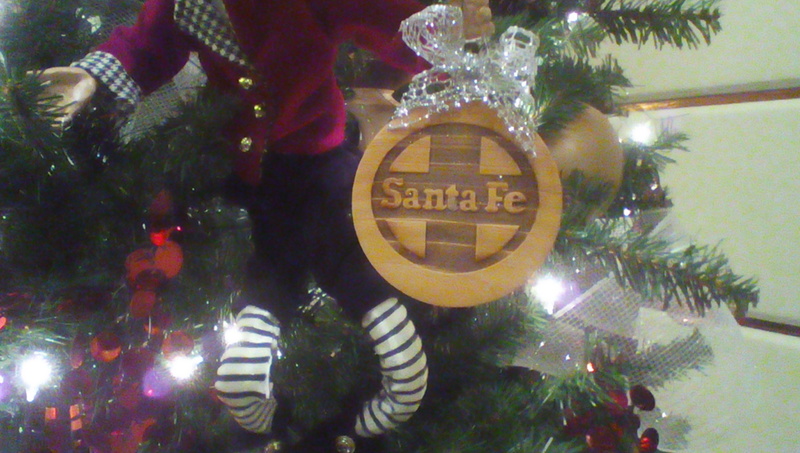 As the train set was in progress, I turned to making ornaments. Debbie urged we buy a nine foot artificial tree and, when I asked how many ornaments would be required, she replied “lots.” Event rules require the tree to be decorated on all sides. I made the ornaments in sets of a dozen so there would be a sufficient amount to go on all sides. Bells, complete with clackers, were turned from the cedar plank. Small balls with painted belt were turned from maple. Flat mahogany medallions, turned to 3 inch diameter and engraved with railroad company logos, continued the train theme. 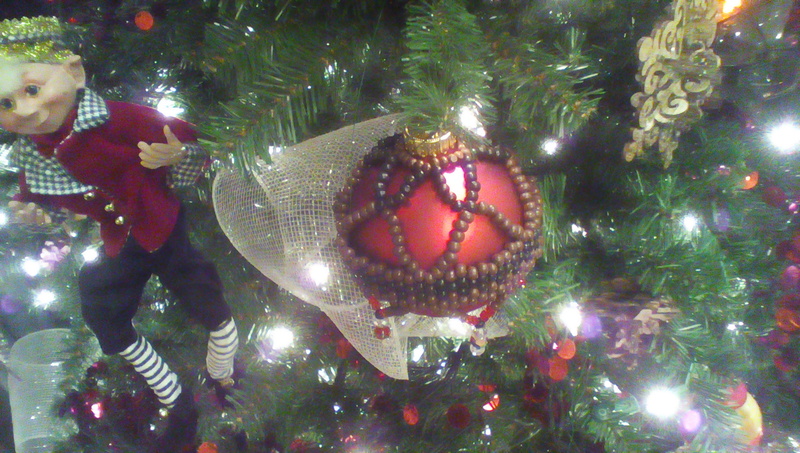 For the fourth set of ornaments I settled on large balls. As the pine plank was not thick enough to turn four inch balls, I made them in two pieces glued together at their hemisphere. This allowed me to hollow them out to reduce weight. 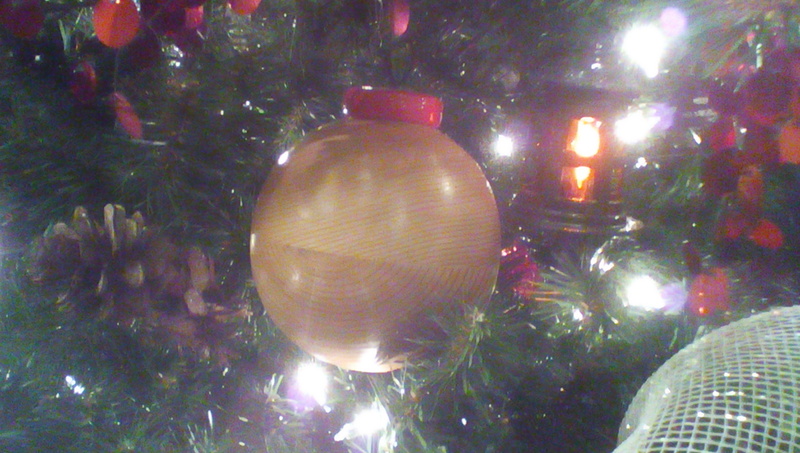 Finally Chris Root, one of Debbie’s crew made a set of glass balls covered with wood beads. 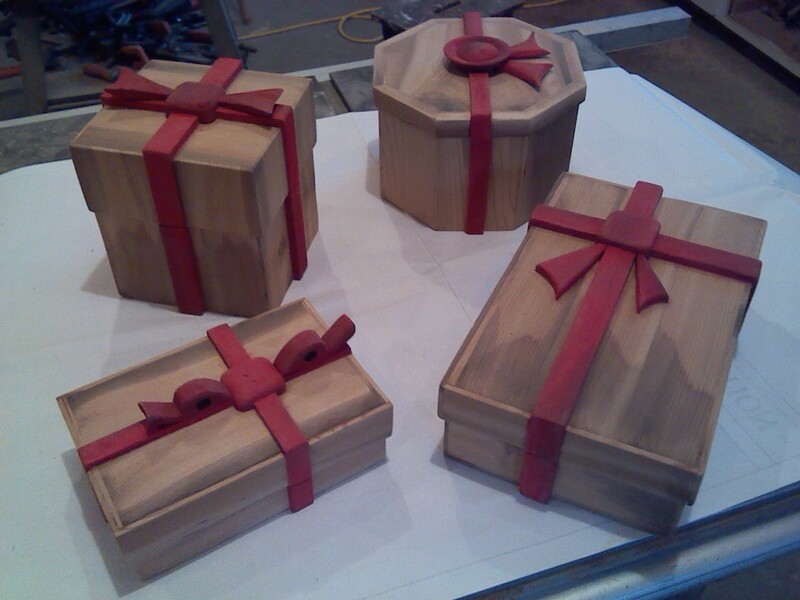 As an added surprise, I made four wood boxes from the cedar plank. Each was to be filled with its own treat. One had foil covered candy coins, the second contained handmade Christmas cards, another chocolate oranges, and the third candy canes. Each item represented traditional Christmas gifts. About mid-October more than 70 handmade ornaments were ready for decoration. I turned my attention to peripheral items that would surround the tree. 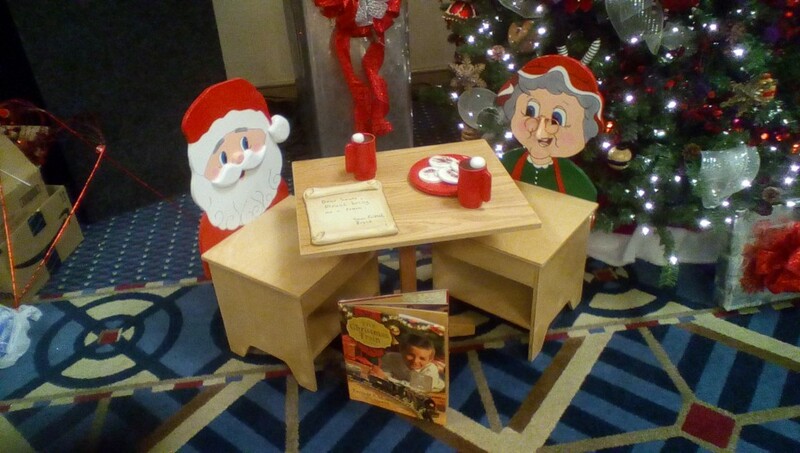 I had previously made children’s theme chairs and decided to make a Santa and Mrs Santa set for our tree. Debbie, in addition to being a decorator and a talented artist, drew the chair backs and I added a table. Debbie then painted the chair backs. 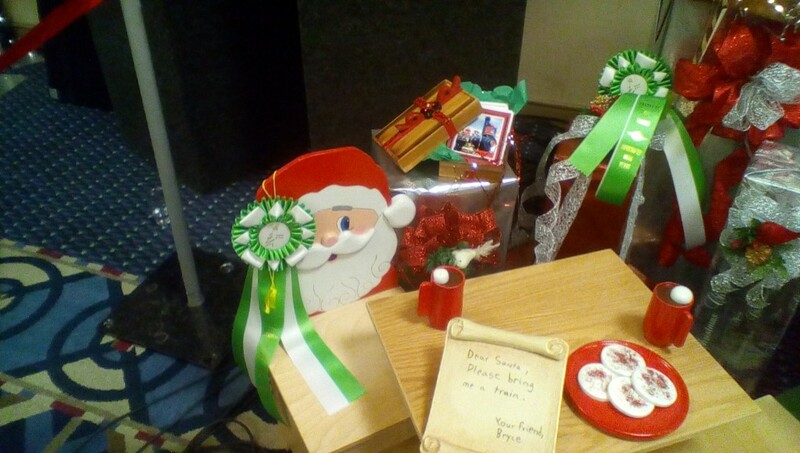 Of course, the scene could not be complete without a snack for Santa, so I added a plate of decorated sugar cookies and two mugs of cocoa complete with marshmallows, all made out of wood. As the Thanksgiving Day deadline loomed, Debbie and her design partner Kim Torgeson sprang into creative action. The tree was purchased and set up in my garage as that was the only place with enough ceiling height. 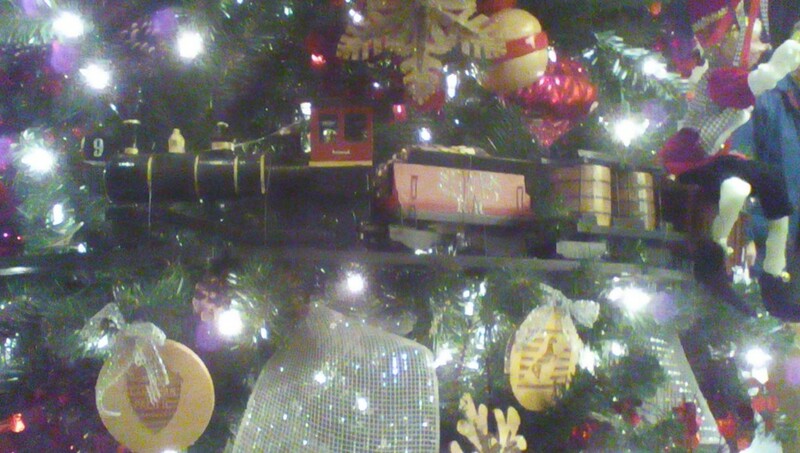 Immediately they decided the train set would be better displayed as a part of the tree. It was decided to mounted it to the track and suspend it climbing up the side of the tree. To complete the scene, an elf doll was envisioned climbing a ladder to carry the caboose into place and I was commissioned to build the ladder. After the ladies left our design meeting, I received an email with a picture of a rocking engine and a request, “Could I make one like this?” The challenge was on. It took some time to scale the picture to child sized proportion. It came together in about two weeks complete with red oak runners, turned wheels, hollow coopered boiler, and an open topped cab suitable for storage. Debbie again provided the artistic paint job complete with engine number and name. An appropriately costumed engineer add a finishing touch. Early on the day after Thanksgiving the tree and ornaments were delivered to the hotel ballroom. The designers brought garlands, drapings, and other “bling” required to complete the scene. A rail crossing sign served as the tree topper. After four hours and much labor by an army of helpers, three tables of “stuff” magically made its way into exactly the correct placement. 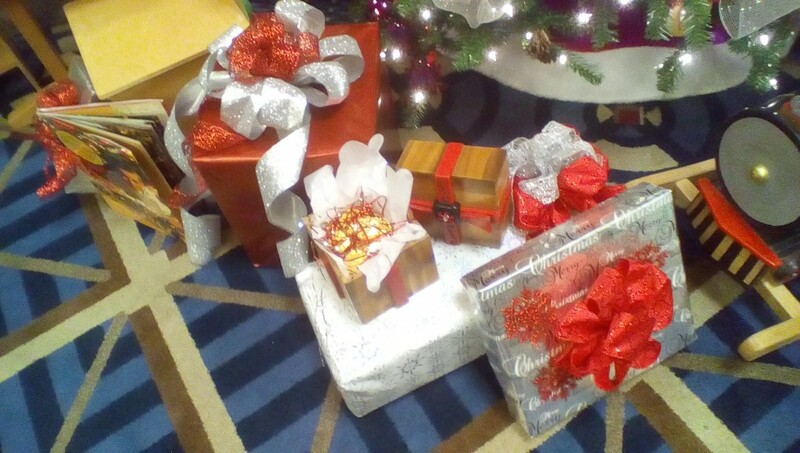 Faux wrapped packages and my wood boxes crowded around the tree bottom ready for Christmas opening. The auction was held the Saturday after Thanksgiving. Several of the decorated trees were awarded ribbons and we were fortunate enough to receive two. Much to my relief our efforts were rewarded with a substantial bid price. Hopefully, the new owners will be able to enjoy the tree for many years. This is wonderful! 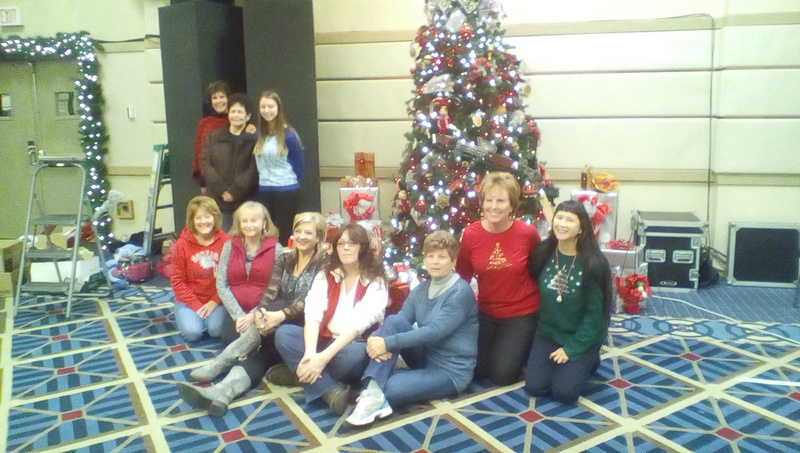 I work for the Kootenai Health Foundation Festival of Trees. Can I share this post on our Facbook Page! Hi Marcee. Yes, feel free to share it on your Facebook Page! Everything looks so wonderful however my concern is putting the food products in cedar, When I went to Lowes a few years back I was talking to the lumber guy about building a picnic table and right away he mentioned do not use Pressure Treated wood or Cedar where food will be nearby. Was he right about the Cedar or was he throwing the bull? For obvious reasons the pressure treated wood made a lot of sense. 1. The cedar is barnwood more than 100 years old and the oils originally present would have long sense dissipated. 2. The boxes were finished with cured lacquer so that the contents would not be in contact with the wood. 3. The contents, foil wrapped chocolate coins, foil wrapped chocolate oranges, and plastic wrapped candy canes, were all isolated from their containers and individually wrapped.